The role of marine pilots is to help ensure that marine transportation in Canada is as efficient as possible while making sure that safety is not compromised. The most visible way in which pilots do this is by using their expertise and familiarity with local conditions to conduct vessels in high-risk waterways. There is another less visible way by which pilots help keep marine transportation safe. Maritime commerce is as dynamic as the country’s economy, which means there is a constant need to adapt and introduce new practices. For example, increased export opportunities for liquefied-natural gas (LNG) led to the development of Canada’s first marine terminal in Saint John, to ship this product to market. Marine pilots worked closely with industry, port officials and government agencies to design the facility and the navigational procedures by which vessels could berth safely. A similar exercise was undertaken in the Quebec City area to ensure a safe operational plan was in place that would meet regulatory requirements compliance. 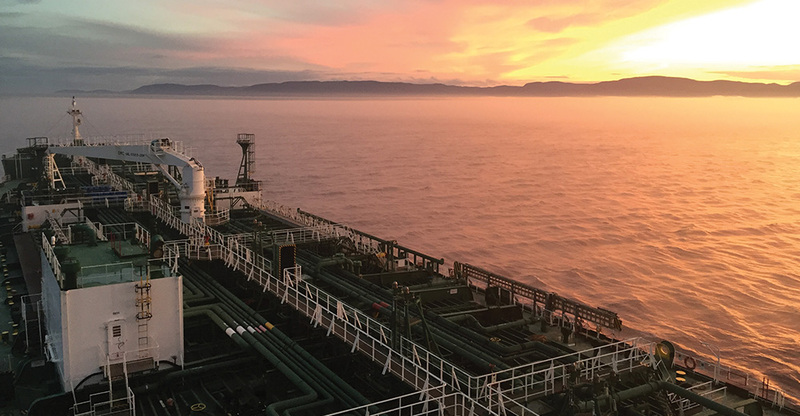 One of the most intense involvements by pilots in the development of safe plans for new marine operations has to do with the proposed shipment of energy products through Canada’s west coast ports. For several years, pilots have worked with energy exporters and a myriad of government agencies and stakeholders to ensure that safety remains the first consideration in respect of any new traffic. In these situations, what pilots bring to the table is not only their expertise in navigation and in local conditions, but also their independent judgement as to what constitutes the safest possible practice, irrespective of commercial considerations. To stay competitive and prosperous, Canada has to constantly innovate and respond to new opportunities. In respect of marine navigation, the challenge is to do this in a manner that maintains our high safety standards and protects the ocean environment. Marine pilots believe that this balancing act can be achieved on the west coast and we remain committed to doing everything within our competence and power to ensure that this is the case. The Transport, Infrastructure and Communities Committee of the House of Commons recently launched a study on trade corridors and the development of a transportation and logistics strategy focused on reviewing current and future transportation and infrastructure priorities as they relate to the planning, construction and funding of transportation infrastructure. For its study, the Committee travelled to the Niagara region, Vancouver and Seattle last September. In Niagara Falls, CMPA Vice-President for the Great Lakes Region, Capt. Mike Burgess, discussed the role pilots have played along the Great Lakes-St. Lawrence corridor to maximize navigation efficiency and to develop key navigational improvements. In particular, he described the role of pilots in facilitating navigation when seasonal aids like lighted buoys are not available to ships, that is, when the Canadian Coast Guard has either removed, or not yet installed them at the beginning and at the end of the season. Capt. Burgess described how innovative practices for navigation extend the operating season of the Seaway, thereby providing significant efficiencies for shippers and shipowners. He also presented an economic case study substantiating the marine mode’s competitive advantage as the most cost effective means for moving grain and other commodities, and the opportunities for modal shift in favour of the marine mode if the navigation season on the Seaway was further extended. In Vancouver, CMPA Vice-President for the Pacific Region, Capt. Rob Stewart, and the President of the British Columbia Coast Pilots, Capt. Roy Haakonson, presented two case studies focused on the dynamics of facilitating the safe and efficient passage of larger, and deeper draft vessels. The case studies provided examples of the role pilotage plays in advancing Canada’s competitiveness. One of them notably described how, through the development of new navigational procedures, pilots were able in recent years to safely handle larger container ships at berths that were originally designed to accommodate much smaller vessels. This resulted not only in productivity gains and savings of tens of thousands of dollars per ship for shippers and shipowners, but also allowed Vancouver and Prince Rupert to increase their share of containerized imports moving to the U.S. – with the positive economic impact of shifted traffic to Canada being in the order of $150 million annually. The case studies presented to the Committee are part of a larger study analyzing the cost-benefit of pilotage in Canada. That study is available on the CMPA’s website. The recently-completed Pilotage Act Review is an indication of the Government of Canada’s current preoccupation with marine safety, as are other aspects of the Oceans Protection Plan (OPP) launched in 2016. Of course, the Canadian Marine Pilots’ Association shares this focus on marine safety. It is in this context that the CMPA has held discussions with a wide range of stakeholders, including First Nations, and has undertaken public opinion research to help understand the best way to describe and communicate the important role pilots play in ensuring, in the words of the OPP, a “safe, efficient and environmentally-responsible” pilotage service. 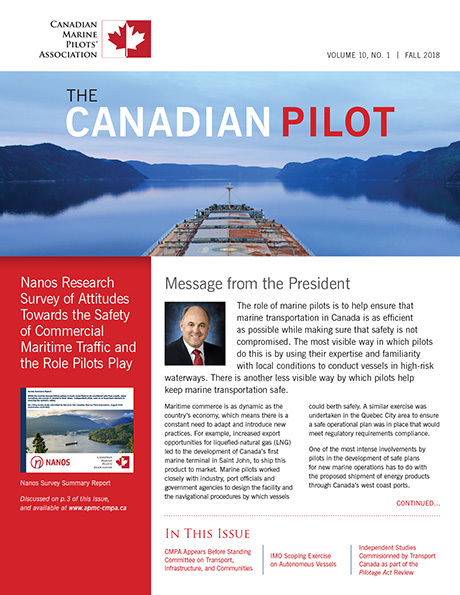 The Association engaged one of Canada’s leading public opinion research companies, Nanos Research, to undertake a public opinion survey of 1,000 Canadians living in key federal maritime ridings, and to conduct focus groups with participants from the Lower Mainland of British Columbia to determine perceptions and attitudes towards the safety of commercial maritime traffic and the role pilots play. The results indicate Canadians are much more likely to rate marine transportation safety as being high, rather than low, although many remain unsure or uninformed. A strong majority believe Canada’s waterways are best kept safe when marine pilots can exercise professional judgement independent from shipowner influence. In fact, most Canadians are of the view that if pilots’ ability to exercise independent judgement is compromised, maritime traffic should be restricted. Another key finding is the opportunity that exists to increase Canadians’ confidence in the safety of the marine transportation system by increasing their awareness of the role pilots play. 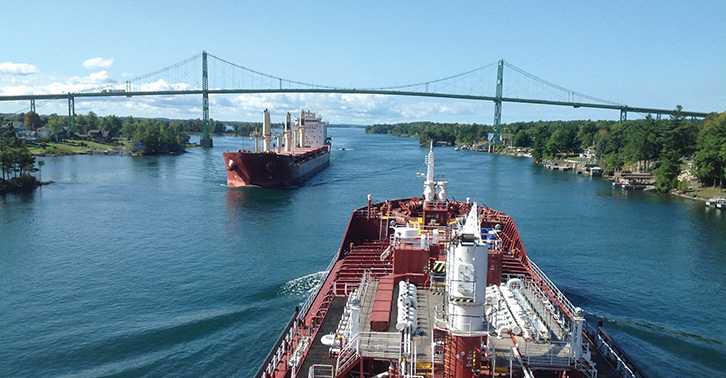 Given clear public support for maintaining a system in which pilots are independent, promoting a greater understanding of Canada’s pilotage regime can only lead to stronger support for shipping as a whole. The IMPA leadership has devoted considerable resources over recent years to study this subject, with the goal of developing a realistic assessment of the technology and of its implications. In the end, pilots, and most other people knowledgeable about ship operations, including shipowners, recognize that the enthusiasm around Maritime Autonomous Surface Ships (MASS), as the International Maritime Organization refers to these units, is largely unrealistic and often generated by technology vendors, and a few coastal government administrations with an agenda, rather than by the ship operating community itself. This is because, in the real world, both the benefits, and the feasibility are still largely nonexistent. Supporters of MAAS try to create the impression that the growth of autonomous vessels is happening fast. This is not true. Despite sensationalistic claims, there will not be unmanned, remotely navigated, or fully autonomous ocean-going vessels arriving in pilotage waters in the foreseeable future. Autonomous operations may be introduced in the relatively near term in certain inland waters, but with small, single-purpose vessels. However, operating large commercial vessels across the oceans and into ports and other restricted waters, without any control by humans onboard, will continue to face insurmountable technological, economic, safety, and social acceptability constraints for many, many years. Some stakeholders are underestimating the complexity of ships’ operations, as well as the amazing diversity of ports’ and waterways’ configurations. Each and every one is profoundly unique, creating a myriad of different circumstances that impact every movement of ships in very distinct ways. Pilots, however, resist the urge to be dismissive about the autonomous ship movement. While many of its projections are unrealistic, there is a development right now that is significant and that could impact global ship operations and port operations, including pilotage. This development may also have consequences beyond autonomous ships. 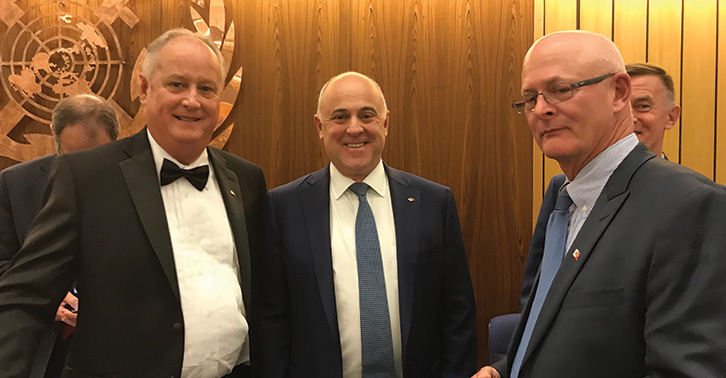 At its meeting last May, the IMO’s Maritime Safety Committee (MSC) kicked off its regulatory scoping exercise for the use of MASS with the objective of identifying provisions in IMO instruments that might preclude or restrict MASS operations. Once completed, this two-year effort will assess the best way to resolve possible conflicts. MSC established a working group to develop a schedule, a workplan, and a methodology for the exercise. I participated in the working group at the MSC session. Frankly, I was not impressed by the discussions. Many of the participants – and, strangely, the most vocal ones – appeared to have very little realworld experience with ship navigation and lacked understanding of the role that IMO regulations play in ensuring safety. What these participants did seem to have a lot of, however, was zeal for rushing ahead with unmanned or remotely controlled ships. IMO instruments establish a well-understood safety framework. Amending a large number of provisions may have significant consequences. This should only be done after having carefully considered all safety implications. Our profession has a special reason to be involved in IMO’s scoping exercise. Some countries have complained that the pilotage requirements of each nation will hamper unmanned or remotely controlled vessel operations. They have proposed that IMO exert control over pilotage, through an international system of pilotage exemptions and other measures, to prevent port state interference. The notion that port states are “interfering” with the regulation of marine operations when they are actually exercising their jurisdiction is unusual. This is especially the case in respect of pilotage which, by its very nature, is profoundly local. IMO itself has on numerous occasions recognized that pilotage requirements were best left to domestic authorities. This new centralizing “push” by the proponents of autonomous vessels is cause for concern. At the same time, other stakeholders suggested that an appropriate way of addressing MASS operations might be in a separate IMO instrument. MASS, however, would still have to be addressed in existing IMO instruments in order to deal with interactions between manned and unmanned ships as having both types of vessels moving in the same waters under different navigation rules would obviously raise significant safety concerns. 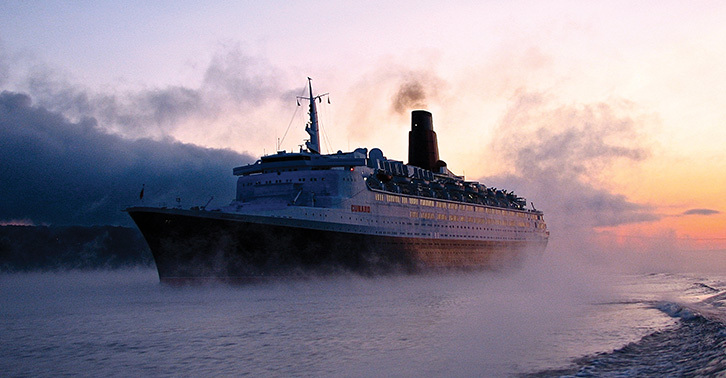 Many believe that going from existing ships’ operations to autonomous vessels is a quantum leap. But a more realistic way to autonomous ships is probably through the evolution of existing systems, not a disruptive revolution. Increased automation in ships’ operations has been underway for decades now. For example, going from manual steering to autosteering, and to more complex auto-track systems. Similarly, moving from manned ER to unmanned ER was made possible with advanced automated machinery. These are all natural steps along a continuum that tends towards more automation. And they were all implemented with due consideration of the impact they would have. So, what is the most realistic next step towards autonomous ocean going vessels? Introducing more automation, on an evolutionary basis, must be driven by user needs! And the first users are the mariners themselves! It cannot work the other way around! In the final analysis, this is only prudent seamanship. In support of the Pilotage Act Review, Transport Canada commissioned a dozen independent studies to provide the Review with analysis on topics requiring specialized expertise. The objective quality of the findings from these independent studies should have meant that they established the generally accepted point of departure for all subsequent discussion and conclusion (research summaries for all studies are available here). In fact, this was not quite the case, resulting in a disconnect between the Review’s Report and the independent evidence found in the expert studies. For example, much was made by some stakeholders of pilotage charges, which they considered to be too high. This stakeholder preoccupation with pilotage costs was addressed in the comprehensive study by the AIM Group on Economic and Competitive Considerations in the Provision of Marine Pilotage in Canada. The study is informed by a review of no less than 53 typical Canadian pilotage assignments involving various vessel types and cargo from Canada’s four pilotage Regions and by specific analysis conducted from the point of view of service reliability and responsiveness, of safety, and of specific trades. In 2016 the magnitude of pilotage costs amounted to approximately one-tenth of one percent of the value of Canada’s maritime trade. This figure essentially matches the finding of the 1967 study by Campbell (...). Therefore, in the context of the national economy as a whole, pilotage costs do not negatively affect Canada’s trade competitiveness for importers and exporters based on the cost of pilotage compared to the value of marine trade (p. 39). The fact that pilotage charges have proportionately remained the same for over 50 years was considered by the study’s authors to indicate that these costs are reasonable. The magnitude of total pilotage cost for either a container importer or exporter is not likely to affect their transport routing decisions because other cost factors are more significant. The conclusion is based on the data that shows that pilotage costs are lower than the charges for other services that contribute to overall freight rates (p. 45). The netback price received by Canadian dry bulk exporters is not significantly affected by the cost of marine pilotage in a port-related pilotage assignment (p. 46). 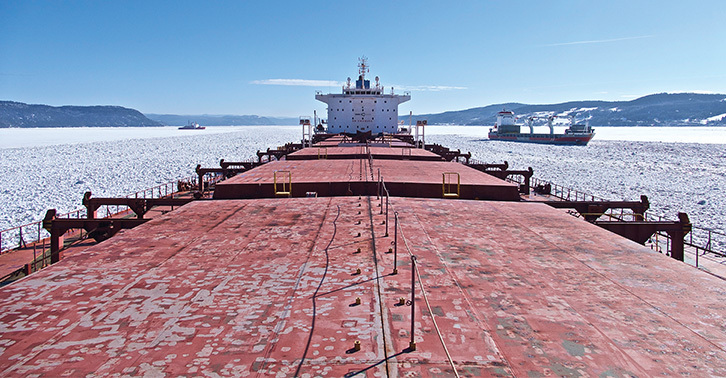 Given the fact that world crude oil prices have exhibited significant price volatility, the cost of marine pilotage would have a minimal effect on the market price and, therefore, on Canadian competitiveness overall (p. 49). In respect of the operating performance of the system, the study addressed questions related to safety, service reliability and responsiveness. From the perspective of reliability and responsiveness, the market for marine pilotage functions efficiently and does not impede economic competitiveness (p. 59). The present system does not systemically create situations where poor safety practices give rise to extra costs for ship owners or cargo interests. As a result, the competitiveness of Canada’s marine trade is not adversely impacted (p. 66). In respect of rate-setting, the AIM Group study recognized the “paramount importance” of distinct regional differences, including the geographic scope of coverage/ service areas, vessel traffic profile, and type of operations and operating conditions. All of these differences affect the criteria for setting pilotage dues, not only in Canada but around the world. The study concluded that the cost structure for the marine pilotage sector “suggests that there are few economies of scale associated with providing the service” (p. 9). The findings above from the AIM Group study validate the conclusion that pilotage costs are not a significant factor affecting competitiveness. Given that this question of cost was of such concern to users, the failure of the Report to reflect the findings from the study remains perplexing. Most jurisdictions, including the European Union, the United States and Canada, have concluded that the public interest and marine safety are best served through pilotage services being provided, on an exclusive basis, by a single group of pilots in any given compulsory area (KPMG, Report on Pilotage Service: International Practices, p. 1). 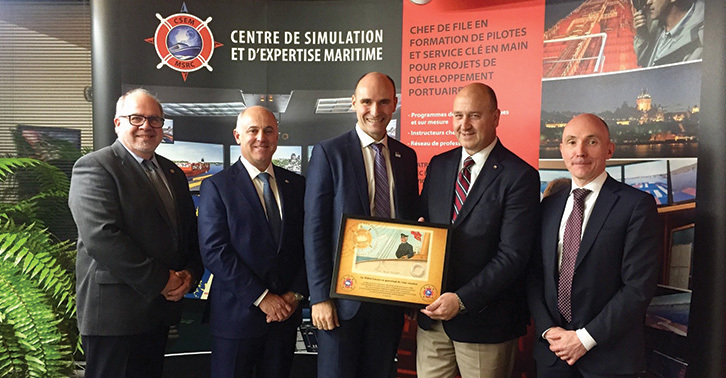 The Honourable Jean-Yves Duclos, Minister of Families, Children Social Development, and Member of Parliement for the riding of for Québec visited the Corporation of Lower St. Lawrence Pilots’ Marine Simulation and Resource Centre in Quebec City last summer. From left to right: the Centre’s Executive Director, Paul Racicot; CMPA and IMPA President, Capt. Simon Pelletier; Minister Duclos; Capt. Carl Robitaille, President of the Corporation of Lower St. Lawrence Pilots; Tristan Laflamme, Executive Director and General Counsel of the CMPA. Pilots Captain Michael G. McGee and Captain Michael C. Phillips, from Houston, were recognized for their role in averting a major tragedy in September 2016, and received the IMO Award for Exceptional Bravery at Sea during a ceremony on November 27. The tanker they were piloting, broke down in the Houston Channel in the middle of the night and burst into flames after colliding with mooring dolphins. Capts. McGee and Phillips were rapidly surrounded by a wall of burning fuel as the raging fire spread across the channel, threatening other tank ships and waterfront facilities. Both pilots remained at their stations on the bridge during the fire. They maneuvered the blazing vessel away from surrounding ships and facilities, coordinating firefighting efforts with the Coast Guard and local fireboats, while also putting out a fire on the port bridge wing. From left to right: Capt. 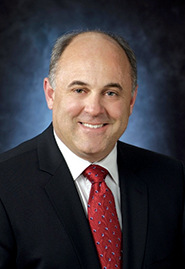 McGee; CMPA and IMPA President, Capt. Simon Pelletier; Capt. Phillips. 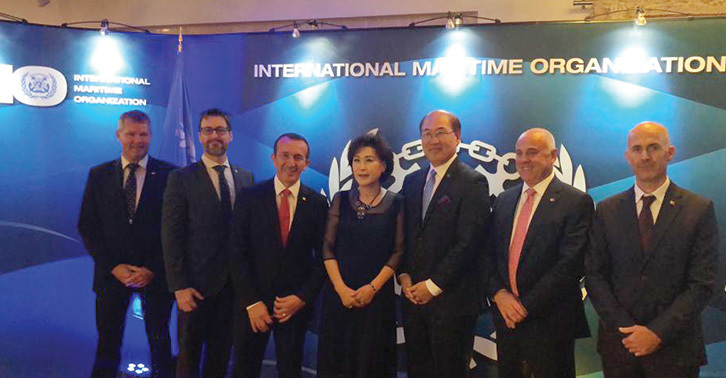 Pilots participated in the World Maritime Day in London at IMO’s headquarters on Sept. 27 with the Organization’s Secretary General, Mr. Kitack Lim. From left to right : Lars Sigvardt (Denmark); Alain Arseneault (Canada); Jean-Philippe Casanova (France); Ms. Lim; Mr. Lim; Simon Pelletier (Canada); Jean-Daniel Gilles (France). This issue’s Vantage Point is courtesy of CMPA President, Capt. Simon Pelletier, from the Lower St. Lawrence pilotage district and was taken this summer during one of his assignments. The photographs above on the left and right are courtesy of Capt. Louis Rhéaume, from the Lower St. Lawrence pilotage district while the picture in the middle is courtesy of Capt. Martin Mangan from the Upper St. Lawrence District. The cover photograph is also courtesy of Capt. Louis Rhéaume, and was taken on the Saguenay River. Marine pilots operate around the clock, coast to coast, at times in fair weather and in spectacular surroundings and, at other times, in conditions that are extremely challenging. We welcome all photographs that convey the experience of pilots and highlight the nature of their work.